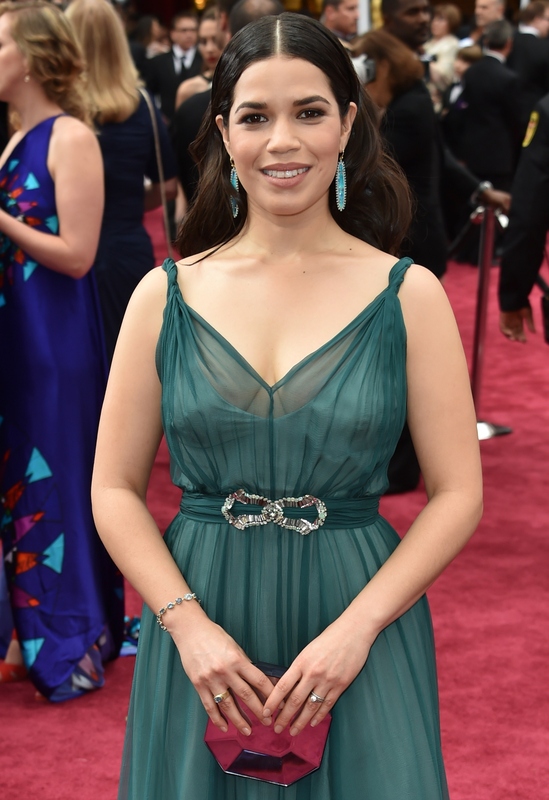 America Ferrera On Oscars' #AskHerMore Red Carpet — "I don't Miss Those Questions At All, Not Even A Little Bit"
While the most interesting thing many hosts were commenting on at the 2015 Academy Awards' red carpet was the rain, some interviewers managed to squeeze in meatier questions, thanks to the #AskHerMore campaign. The campaign, which urges interviewers to ask female celebrities about more than their dresses or diamonds, is pushing back against sexist red carpet mentality. Celebrities like Reese Witherspoon and Patricia Arquette are spearheading the effort, with Witherspoon stating on the carpet: “We are more than our dresses." Ryan Seacrest appeared to have partaken in the campaign, asking America Ferrera about her participation in How To Train Your Dragon 2, and her emotional response to seeing the film. While her emerald green gown was absolutely stunning, it was refreshing to hear the Sisterhood of the Traveling Pants actress being asked about more than her appearance. So how did Ferrera like the change? "It's funny you should ask," she says. "It was lovely, and something I commented to my husband about. I said, 'Wow, that was really not stressful.' I love being asked questions about why I'm there, my work, and how I felt about it. It felt good." She continues to say: "I did take note that people weren't asking me what my diet or fashion secrets were, or how I squeeze into my dress at the Oscars. I have to say I don't miss those questions at all, not even a little bit."